Apart from Andrew and Trish two other crew members boarded Sengo when she arrived in Sydney in 2014. Tiger is a middle-aged tabby cat. He likes sleeping, eating and sleeping. He doesn’t like engines and likes movement of the boat even less. He is prone to sea sickness in bad conditions. 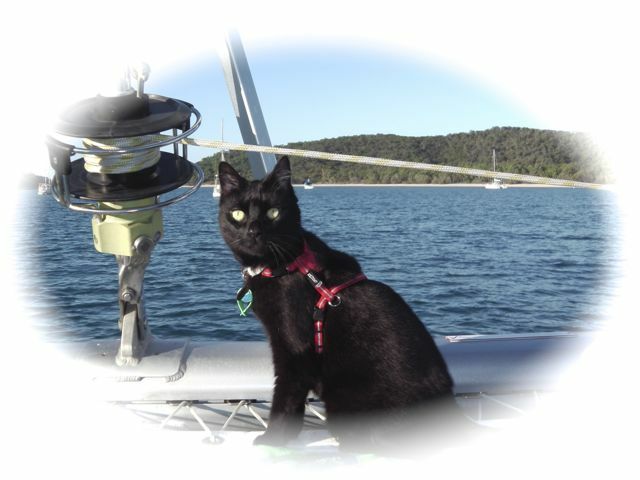 His preferred time to explore the outside of the boat is coming into the evening. Birds flying around the outside of the boat, or sitting on the lifelines, amuse him and he keeps a good eye on them (but that’s all he does). He slinks inside at the approach of anything noisy or unknown. 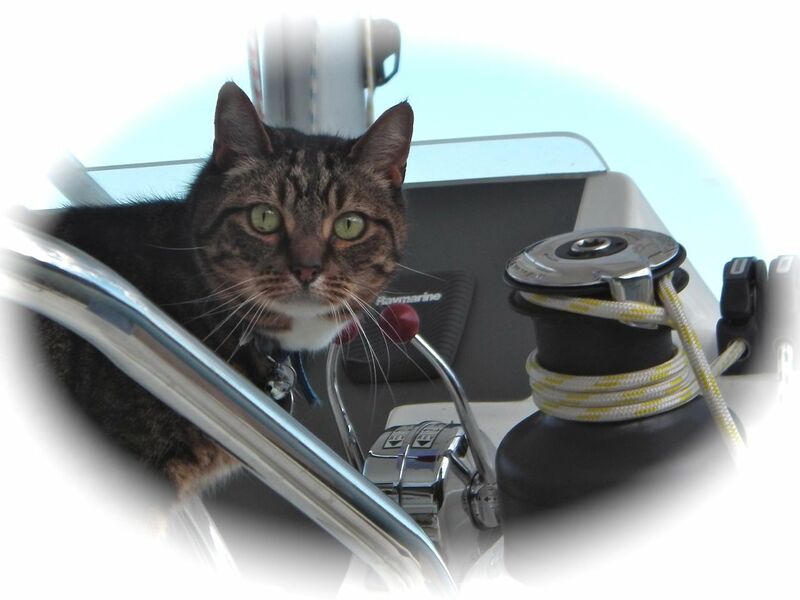 If curiosity strikes him Tiger will sit at the helm station, either on the helm seat or the shelving behind it, to get a better view of the world. Cilla was a skinny old woman. She was black, but if you looked closely in the right angle to the sun you could see tabby markings. She liked sleeping, eating and sleeping. She was always alert at lunchtime just in case a can of tuna was opened and she demanded the liquid from the fish (however, she wouldn’t accept anything other than brine). Her preferred time to be outside was during the day but she spent most of it sleeping on the cushions in the aft cockpit and she often put herself to bed in the aft starboard cabin around 8pm. If she managed to notice the birds flying or sitting on the lifelines she ‘chattered’ at them with wild teeth. She occasionally took a casual morning inspection of the deck (if she could be bothered) but usually only a parade around on purpose if a human had shooed the birds away first. She had a propensity to explore anything with water in it, often drinking the rain water out of the kayak on the foredeck. and we needed to be wary if a bucket of sea water was up for the dishes as she was likely stick her head in it or tip it over for a further look. Cilla went to the great catnip garden in the sky on 24th October 2017. She will forever be very greatly missed and the rest of the crew won’t be the same without her.